We can perhaps remember, even if only for a time, that those who live with us are our brothers; that they share with us the same short moment of life; that they seek, as we do, nothing but the chance to live out their lives in purpose and happiness, winning what satisfaction and fulfillment they can. 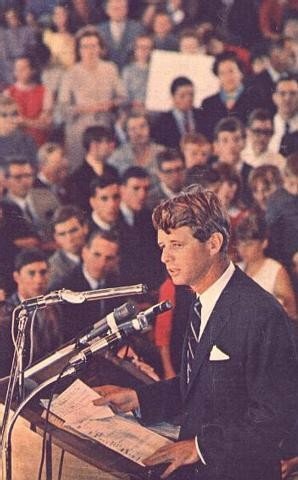 The one thing you could count on with Robert Kennedy was that he would speak his mind. He held nothing back, for fear of the audience or how a particular subject may be received. Therefore, to determine his position on a particular policy, one had only to refer to his speeches for clarification. or helped build a bridge or a university? Which of them would have taught a child to read? It is our responsibility to let these men live....It is indecent if they die because of the empty vanity of their country. I do not want to simply withdraw or surrender in Viet Nam. But for two years I have been concerned that our course would not bring victory; would not bring peace; would not stop bloodshed; and would not advance the interests of the United States. I have been concerned that we could fight for a government which would not end its widespread corruption; would not make its best efforts in its own defense; and would watch as more American lives are lost. These brave men fighting this difficult war must know that we are vigorously pursuing an honorable peace. For on this generation of Americans falls the full burden of proving to the world that we really mean it when we say all men are created equal and are equal before the law. All of us might wish at times that we lived in a more tranquil world, but we don't. And if our times are difficult and perplexing, so are they challenging and filled with opportunity. We must begin to bring the talents, skill and resources of the private enterprise system into the struggle to end poverty and deprivation, in urban and rural America. Government must join in a partnership with industry, permitting private enterprise to help solve the problems of housing and unemployment in our deprived areas. There is another kind of violence, slower but just as deadly destructive as the bomb or the shot in the night. This is the violence of institutions; indifference and inaction and slow decay. The greatest enemy of freedom today of course is communism a tyranny that holds it s captives in a vice like subjugation on a global scale. For nearly twenty years we and our Allies have striven to halt the Communist advance. But one of the weaknesses in our common front has been the restraint on freedom sponsored by our Allies and accepted by ourselves. The conduct of our foreign affairs should be consistently based on our recognition of every man's right to be economically and politically free. This is the American tradition. We must reform the flagrant tax loopholes which enable too many Americans to escape their fair share of the cost of shaping our nation's destiny. Half a million American children suffer from serious malnutrition, and I have seen of them, some of them, I have seen personally some of them starving in the state of Mississippi, their stomachs bloated, their bones and their bodies scarred, many of them retarded for life. Up to 80 percent of some Indian tribes are unemployed. And the suicide rate among the high school children is shockingly high, dozens of times the national average. For the black American of the urban ghetto, we really do not know what its unemployment rate is, because from one-fifth to one-third of these adult men in these areas have literally dropped out from sight, uncounted and unknown by all of the agencies of government, drifting about the cities, without hope and without family and without a future. By these standards, we are not so rich a country. Agriculture is the root of our economic strength, with twice the workers and four times the assets of any other industry -- yet more and more farmers are being forced off the land. In parts of America, farm income is one-third to one-fourth off. We must bring greater income to farmers and provide realistic credit in adequate amounts, especially for the small farmer and the young man beginning an agricultural life. people in other lands wish it so. We must do it for the single and fundamental reason that it is the right thing to do. These are not ordinary times, and this is not an ordinary election. At stake is not simply the leadership of our party or even our country -- it is our right to moral leadership on this planet. Too much and too long we seem to have surrendered community excellence and community values to the mere accumulation of material things…Our gross national product does not allow for the health of our children, the quality of their education, or the joy of their play. It does not include the beauty of our poetry or the strength of our marriages, the intelligence of our public debate or the integrity of our public officials. It measures neither our wit nor our courage, neither our wisdom nor our learning, neither our compassion nor our devotion to our country; it measures everything, in short, except that which makes life worth while. And it can tell us everything about America except why we are proud that we are Americans. We in Government have begun to recognize the critical work which must be done at all levels—local, State and Federal—in ending the pollution of our waters. Rising crime rates and community violence are an intolerable threat to every American, black or white. A violent few cannot be permitted to threaten the well being of the many. We must wipe this stain of violence from our land. But punishment is not prevention. We will reestablish our domestic tranquility only when we resume our march toward full constitutional justice -- so that every American citizen has a fair chance at a job and an education and a decent place to live. The future is not a gift: it is an achievement. Every generation helps make its own future. This is the essential challenge of the present. The future does not belong to those who are content with today, apathetic toward common problems and their fellow man alike, timid and fearful in the face of bold projects and new ideas. Rather, it will belong to those who can blend passion, reason and courage in a personal commitment to the great enterprises and ideals of American society. An integral part of all this is that we make a total effort to guarantee the ballot to every American of voting age - in the North as well as in the South. The right to vote is the easiest of all rights to grant. The spirit of our democracy, the letter of our Constitution and our laws require that there be no further delay in the achievement of full freedom to vote for all. Our system depends upon the fullest participation of all its citizens. crucial time. We can go in either direction. But if we don't make a choice soon, it will be too late to turn things around. I think people are willing to make the right choice. But they need leadership. They're hungry for leadership. We know that it is law which enables men to live together, that creates order out of chaos. We know that law is the glue that holds civilization together. And we know that if one man's rights are denied, the rights of all others are endangered.